Will you use Astrobites in your course this Fall? If you were reading Astrobites back in November, you may remember us asking you to share your stories about how you’ve used Astrobites in the classroom. If you reached out to us at that time: thank you! 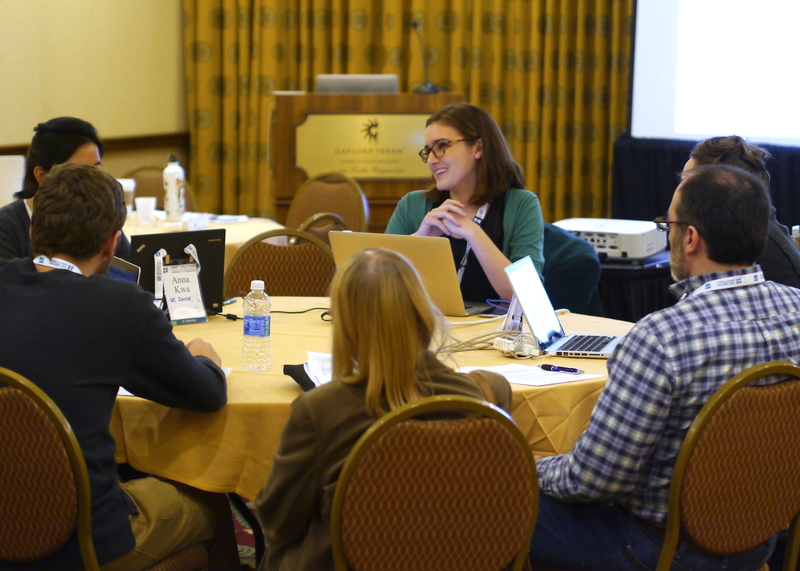 Your responses helped us to guide a great discussion that took place at the January 2017 AAS meeting, and both those activities led to a new paper that appeared on the arXiv this week. In this new work, authors in the Astrobites collaboration provide a rich variety of strategies for how to integrate current research methods, results, and literature in the classroom. The paper includes three full lesson plans complete with student handouts, online form templates for collecting student work, grading rubrics, adaptations for different learning levels (introductory undergraduate, advanced undergraduate, and graduate), and more. Fig. 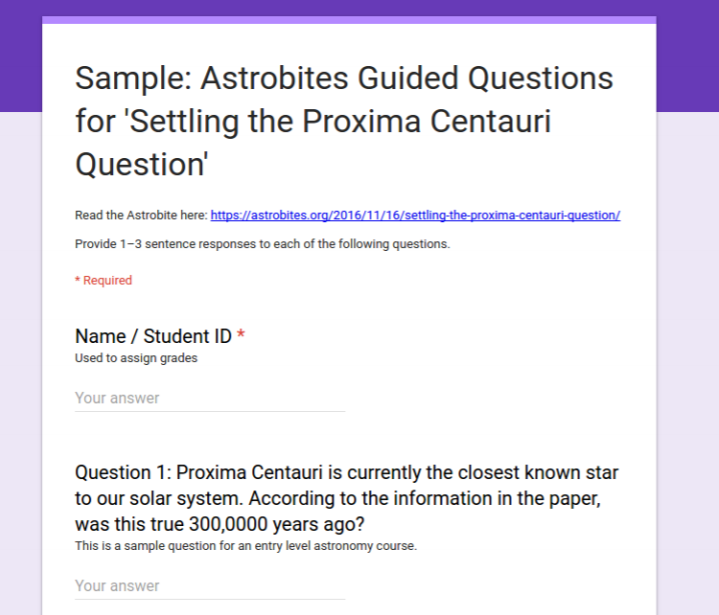 2 from the paper, a screenshot of the online form template for students to submit questions for the periodic reading assignment lesson type. Longtime Astrobites readers will remember our brief 2012 paper in the Astronomy Education Review that tackled the same topic. What’s new in this work are the insights from all the students and educators who participated in our survey and workshop, the rich materials we’ve developed with that feedback, and knowledge and lessons learned from Astrobites first seven years of operations. If you have used Astrobites in your classroom in the past or are thinking about doing so, we’d love to hear from you and we want to keep in touch. Please feel free to leave comments below or contact us directly at astrobites@gmail.com. Nathan: As a big fan of Astrobites ( and Ashley Villar! ) I have forwarded a number of bites to the middle school students in my care who are not intimidated by words they do not understand, I encourage pursuit of knowledge and the willingness to overcome what some would interpret as obstacles. Ashley tells me that a k-12 version of Astrobites is in the works which should work for the average middle school or high school student. not just the exceptional few for whom nothing stops them. I have had limited success with class discussion and pointed questions regarding scientific explanations of Astronomical Phenomenon. I encourage your effort and exploration but predict moderate success – even with passionate students. A real human being presenting a talk on the subject has universal appeal. My 5 year old grandson could not get enough of Elisabeth Newton’s talks on red dwarfs.My observation – real person first, science second. Thanks for your message and for your thoughts about using Astrobites with students! I think you’re absolutely right – Astrobites, which focuses primarily on the undergraduate audience, will have limited applicability for much younger students. In preparing the AJP paper linked here, we learned a lot about what strategies can help make our articles fit into a wider range of higher education settings, but I think fundamentally different materials are needed at the middle school level. Hi Nathan, I read your group’s paper on using Astrobites to introduce university students to the research process. I like it. I think it could be a useful resource for professors. I also noticed that you misspelled my name in your citation of our paper, “Establishing a Student Research and Publishing Program in High School Physics” (#6 in the footnotes). You spelled my last name Eagles. My name is Eales. Would it be possible to correct that mistake so that my work is correctly attributed in your paper? I would be grateful if you could do that.